Fitness center with free weights and cardio equipment. Westshore Mall and International Plaza are both within a mile. 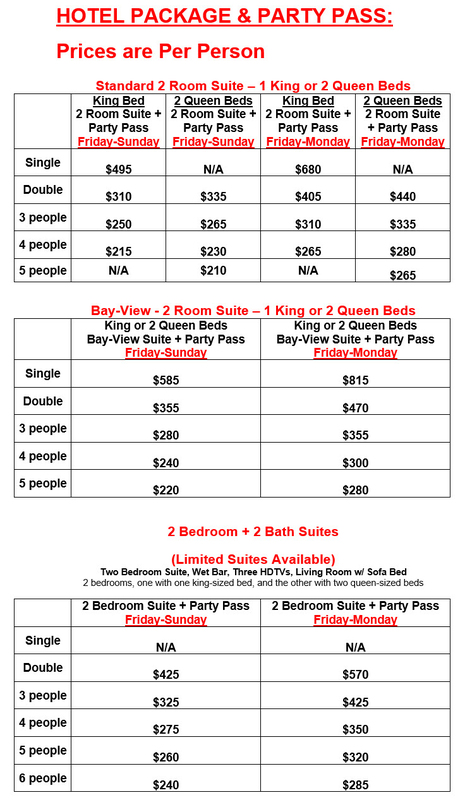 Room & Party Pass a minimum deposit of $135 per person is required to lock in your room. At least 1 person in your room will need to pay a minimum deposit of $135 to lock in your room. Deposits are due ASAP and are per person (including roommate(s) of registered guests). Final payments, after deposit, are due no later than March 8th. We send all trip important reminders and updates via email, once you have signed up. So please make sure everyone’s email address is correct when booking your room and/or party pass. After February 8th there will be NO refunds for cancellations made after February 8th. No Refunds will be issued for NO Shows regardless of transportation issues due to illness, sudden death, cancelled or delayed flights and/or problems with any other means of transportation. After February 8th payments are NO longer transferable to a registered guest of FL Takeover. Hotel allows up to 4 guests per room (5 guests for double bed rooms), includes 2 or 3 nights accommodations, events, and taxes. Groups may sign up individually, but please provide your roommate(s) information. Name Changes are subject to availability after March 8th.